Once again, I was drawn to the south. This time it should be a motorcycle tour with desert, sand and sea. Let's go to the Maghreb states. 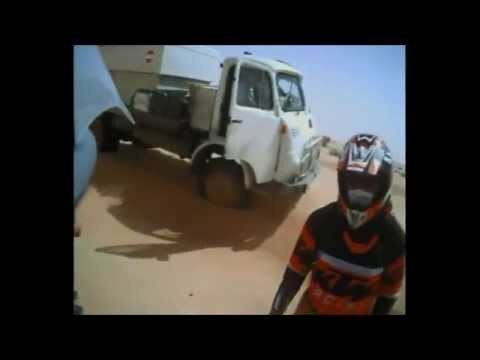 I wanted to discover Tunisia off-road by motorbike. This tour report was published in the motorcycle magazine Wheelies issue October 2007 from page 20 . Click here to view the route in Google Earth or here to open the map in a new tab. At the German-speaking tour office Walkabout Travel I booked the necessary ferry tickets for myself and my motorbike and went to Switzerland to make friends. The next day, when I wanted to travel under the barrier through and over the Grimselpass, it was closed. At the top, snow groomers and snow blowers fought their way through the meter-thick snow of last winter. So I had no choice but to drive comfortably over Interlaken to Genoa. After 24 hours we arrived three hours late the port of Tunis. The drive through the customs was relatively fast for African conditions. We had already done the necessary formalities for the entry with our own vehicle with long waiting times at three different counters on board. Since the Austrian group knew the GPS coordinates of the camp Jasmine in Nabeul 70 kilometers away, it was already dark and raining, I joined them. The next day we were first shown by a guide the city of Kairouan. Then we drove down to Tozeur. Since we were traveling a bit too fast, a common fall of the 990's Adventure driving ahead lost its mirror and the 450cc EXC could not avoid a mud passage. The further we came, the steeper and steeper the terrain became. To be able to keep up with the group, without my feathers constantly pitching at big stones, the truck loaded my tent . In the late afternoon we reached Tozeur, where we rented small huts on one of the two campsites. The Belvedere campsite is, if you forget the lack of toilet seats and the generally missing in Tunisia toilet paper, very well maintained and even offers hot water in the showers. The next day we left our stuff at the campsite and drove a relatively heavy track towards the scenes of the famous Scince Fiction movie "StarWars" (GPS coordinates: N33 06.004 E10 18.816 7 ° 50'34.11 "E). Occasionally we took breaks in interesting places where everyone could prove their driving skills and courage before moving on. While I tried to keep up with the group on the partially sandy track, at about 100 km / h in the glaring light of the midday sun, I overlooked a dried out moat in which the front wheel got stuck. The rear of the machine lifted and I flew over the handlebars through the windshield, fortunately without hurting myself (in jeans) while the bike overturned several times behind me. With only one fall, I managed to damage the cladding of the machine on all sides. Fortunately, despite the bent handlebar, crooked fork and mirror, etc., the machine was still in a fit state, my demolished suitcases were loaded into the patrol and on we went. In the steadily softening sand of the show dunes beside me also the driver of the LC8 had to fight despite grobstolliger tires. At last at the finish, intrusive traders did not manage to tarnish us the pleasure of sightseeing. It's really amazing how easy it was to rebuild life on another planet with wooden slats, plaster and old pipes. Back to the campsite we went on a less difficult but uncomfortably hard and tiring corrugated piste. The same day I had the bike provisionally welded by a locksmith. The next day I separated from the country-loving Austrians, not to drive the track but the asphalt road through the Chott El Djerid direction Kibili and on to Douz. On the almost endless, straight road I felt like the sea. It was windy, smelt of salt and water was on either side of the road. In order for the tourists to stop near their stalls, locals had built so-called sights next to the road. A good photo opportunity is next to the sunken bus actually only the known, lying on dry land boat. The farther I moved away from the Algerian border, the warmer it became without the wind stopping. Before Douz I came in the shadow in a sandstorm at 40 ° C and was glad when I finally could take a shower in the campsite Club Desert. Douz is relatively small. There are, however, numerous money exchange options, hotels and many camels called dromedaries, but unfortunately also many mosquitoes. In the evening, the Austrians happen to arrive at the same campsite and report on how strenuous and difficult the ski run around the Chott has been. The next day, my Honda Transalp only started on one of its two cylinders as I started to leave alone on the pipeline track towards the oasis Ksar Ghilane. I quickly realized that the other cylinder had no spark. To be able to exclude a defective control unit, I exchanged the two CDIs against each other. Since the error persisted and I could rule out a defective ignition coil due to the double ignition I wobbled with the engine running through the various cables until the engine speed increased by the onset of the second cylinder. The repair of the broken cable and the reloading of the motorcycle was done quickly. After a few kilometers I met three Frenchmen who wanted to drive the supposedly light track through the desert to the oasis with their Yamaha XT 600e motorcycles and joined them. Unfortunately, the initially wide track was constantly dividing and became ever narrower due to sand drifts until finally we could not find them anymore. After searching a few miles in vain, we discovered that we had lost our way to Greenhorns with scarce fuel reserves and my rapidly dwindling 8 liters of drinking water but no GPS or compass in the Sahara. As the sun was just above our heads at lunchtime, I marked the shadow of my side cases in the sand to determine which direction he is shifting. That's how I determined the East. We drove in this direction until after 20 kilometers in which we had always sent back, we finally met the paved pipeline track where we parted again. Now it was only 40 kilometers, past grazing sheep and dromedaries in front of which signs warned, until I reached the southernmost point of my motorcycle tour, the oasis Ksar Ghilane after a total of almost 2000 kilometers. Further south into the restricted area I did not want due to the obligation to drive . Nor did I move on to Libya for lack of a passport translated into Arabic. There exists for tourists off the coastal road since 01.01.2004 also a general obligation to drive. The situation at the border was further aggravated. According to Desert Ship since December 2008 no single travelers but only groups with a minimum size of 5 people to enter Libya. Contrary to my expectations rushed in Ksar Ghilane no intrusive dealers to me. I drove to the campsite El Biben, where I had a nice cold shower. As darkness fell, I visited Ksar Ghilane, lit by a large diesel generator, from the observation tower of a luxury campsite offering overnight accommodation in "Berber tents" with shower and air conditioning. In the next few days was driving training in the sand and swimming in the lake of the hot spring, which allegedly bubbled after a failed Bohrversuch the French in 1956 for oil from 700 meters depth on my program. In addition to many English-speaking tourists from various countries, I also got to know two cameramen from Germany, who were to film the coming Marathon Rally Grand Erg , a material battle for which some riders ride a service car with mechanics for the Hessian radio station. The friendly offer of journalists to accompany them in their Toyota Land Cruiser to the Roman Ksar Rouine just outside in the desert, to see from there the passing vehicles, I did not refuse. Since the drivers of the rally were allowed to deviate one kilometer from the given track, it was not easy to get good pictures. To our delight, however, one of the participants dug in the soft desert sand right in front of our eyes and had to be pulled by a colleague. Before leaving Ksar Ghilane, I had my bike fueled from barrels of gasoline. Unfortunately, this also got a lot of dirt in my tank. I had failed to use my T-shirt etc. as a filter. Although Ksar Ghilane has accommodation for hundreds of tourists, it does not have a grocery store or gas station. Next the tour went 80 km to Matmata. People lived there hundreds of years ago in caves that they dug into the clayey soil of the mountains of the Dahar Mountains. But that also here the progress can not be stopped, prove everywhere existing parabolic antennas. Further north in Skhira I did not believe my eyes, when suddenly suddenly on the road hung dead sheep from which one can have a barbecue. Fast food in Tunisian. Further north, it was getting windier. Here more and more signs were exclusively written in Arabic script and not additionally in French. In the big city of Hammamet, I marveled at the really white sand on the beach, but decided not to go swimming or pitch my tent because of the strong, offshore wind and low temperatures. In a police station a few miles farther on I got the permission to camp there in a sheltered spot for lack of a nearby campsite for one night. As soon as my tent was set up and the sun was setting, two other policemen sent me away. There is too much crime here. So I packed everything together and drove on for several kilometers. There I set up my tent somewhere in an orchard, now completely dark. I abstained from using my headlamp for lighting, so as not to betray my sleeping place and thereby attract curious people. As I cleared my tent in the bright morning after a stormy night, one of the residents surprised by my visit brought me sweet Arabic coffee, marveled at my motorbike, and wished me a good round trip before going on to Tunis. There I got into a traffic jam. while I waited, a BMW pushed forward from the right, drove against my side case and pushed me while I honked and scolded, against the car that had stood on the one-lane road left next to me. All this seemed to bother no one but me. As it went on, the car on my left scratched on my suitcases and forced me to a full stop by turning right without flashing right in front of me, while the driver of the BMW had seen that he does not fit past and a few inches behind kept me. In such situations, I wondered why I had completed the mandatory expensive motorbike liability insurance that no one else wanted to see. After finally leaving Tunis and reaching Bizerte on the same day, despite strong gusty crosswinds, I decided to camp in the Rimel youth hostel, although the densely vegetated coast is actually ideal for wild camping. In search of the well-known shipwrecks east of the beach of Bizerte I came on a narrow track through the dense forest suddenly on a huge motorhome from France, which has apparently been bogged down while attempting to turn up to the axles in the sandy ground. The elderly couple had left the asphalt road in search of a campsite and now hoped to get help by calling their insurance company in Europe. However, since we are true to Africa and things are going a bit differently there, I drove back to the road, stopped an SUV and steered it to the camper. The SUV did not succeed, the four-ton heavy and allegedly 61000.- Euro expensive vehicle with houseplant, satellite TV and a scooter in the rear again to get afloat, but as usual in Tunisia, the driver knew someone who knew someone on a construction site Excavator drives. while we were waiting for the excavator, the French showed me their "house". Then the salvage of the motorhome against Bares had happened quickly and the French followed me to the hostel. Now I made a second attempt to visit the two highly visible shipwrecks, which can even be seen on Google Earth at the coordinates 37 ° 15'7.47 "N, 9 ° 56'53.76" E, up close. while the close military restricted area was being shot, I hid my motorcycle in the forest and walked the last hundred meters over the dunes through the soft white sand. The smaller of the two wrecks lies diagonally a few meters in the water. The bigger and more disintegrated, however, lies directly on the beach and can even be entered. Inside there is an uncanny silence, until suddenly a wave crashes against the side and water penetrates the broken ship. The next morning I went in search of Cap Blank, the northernmost tip of Africa. As I expected, the hike was very stormy but beautiful. Due to the rough wind, the reef is hardly overgrown. There is a fortress on the hill behind. Restricted military area. Back in Bizerte I went for lunch and then swimming in the screened marina. This made me an attraction for the locals, who think the water is still too cold at this time of the year. I was amazed when I saw the motorcycles of the Austrian group in the evening in front of the youth hostel where I camped. As it turned out, my friends had abandoned the difficult plan to drive the Douz runway to Ksar Ghilane and instead drove north along the Algerian border. So it happened that the next day we went together to Tunis to the port Goulette where we met all participants of the Grand Erg Rally again. Absurd was the demand for departure at the border after a dinar for the removal of the vehicle from the passport. Since the export of Tunisian foreign exchange is prohibited, officially no one is allowed to carry any Tunisian dinars in this area. Back in Europe, I learned that the Alpine passes are open in Switzerland. Although it rained heavily, I wanted to cross the 2478 meter high Nufenenpass on the same day. It got colder with every vertical, until it finally started to snow. Fortunately, in the evening I also managed the motorcycle tour over the 2165 meter high Grimsel Pass Road. A few hours later both passes were closed again. During the night 83cm of fresh snow fell at an altitude of 2000 meters.